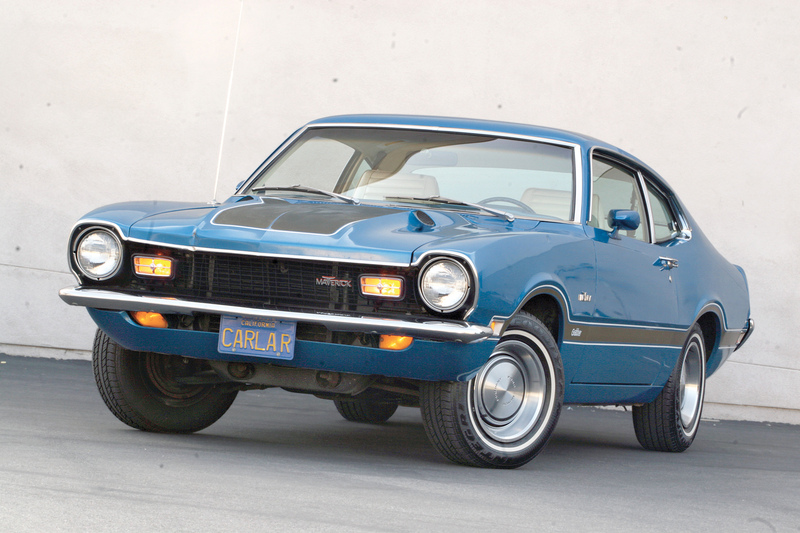 1972 Ford Maverick Grabber. Photos by Jeff Koch, unless otherwise noted. On April 17, 1969, Ford introduced a new compact two-door sedan with sleek fastback styling, designed to counter the sales threat posed by the Volkswagen “Beetle” and other fuel-efficient imports. In its first (partial) year on the market, the Maverick sold 127,833 copies, besting the Mustang’s 126,538 unit sales from April-December 1964. Though the Mustang lives on today, the Maverick — which marks its 50th birthday in 2019 — left the U.S. market after the 1977 model year. By the late 1960s, the threat from imports to domestic sales was growing too large to ignore. In 1968 alone, Volkswagen sold 563,522 vehicles to U.S buyers, while Toyota and Datsun (combined) accounted for another 109,000 sales. In total, Ford’s research showed the size of the 1968 import market (including all manufacturers) to be 985,767 units — large enough for the right car from a domestic automaker to make inroads and enjoy reasonable sales. To reduce the time to market, Ford built the Maverick atop an existing platform, once again turning to the Falcon to underpin a new model. The Falcon’s wheelbase was reduced from 110.9 inches to 103 inches, making the overall length of the Maverick 179.4 inches, compared to 184.3 inches on the Falcon. Ford believed that U.S. buyers would prefer a model smaller than its existing compact Falcon, yet not as small as the subcompact imports. 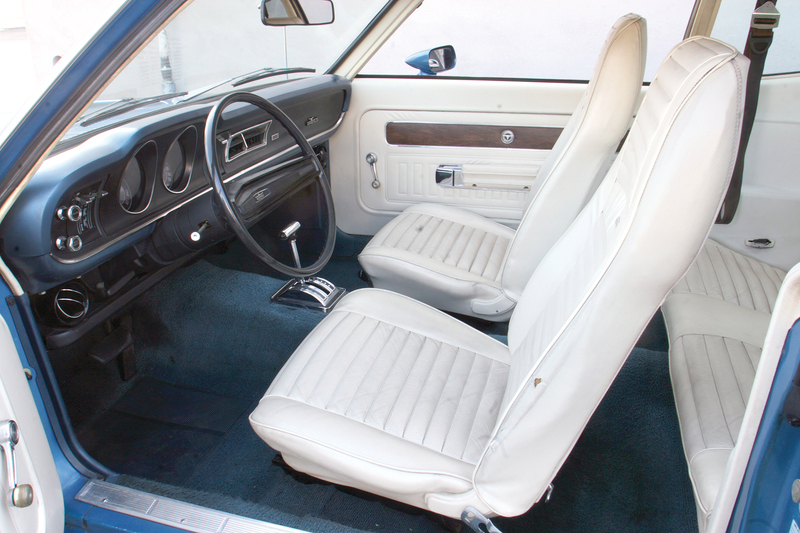 The Maverick was designed to appeal to a younger audience, so available colors for the 1970 model year included Anti-Establish Mint, Hulla Blue, Original Cinnamon, and Freudian Gilt (gold), in addition to the more conventional Red, Dark Ivy Green Metallic, Medium Gold Metallic, Dark Aqua Metallic, Bright Yellow, Medium Blue Metallic, Medium Ivy Green Metallic, Pastel Blue, Black, White, and Vermillion. Inside, buyers could liven things up a bit by ordering “Blazer Stripe Seat Trim,” and other possible options included a SelectShift Cruise-O-Matic automatic transmission, a semi-automatic Transmission, SelectAire air conditioning, a consolette with electric clock, deluxe seat belts, tinted glass, an AM radio, dual outside mirrors, a variety of accent and luxury groups, and a vinyl roof. 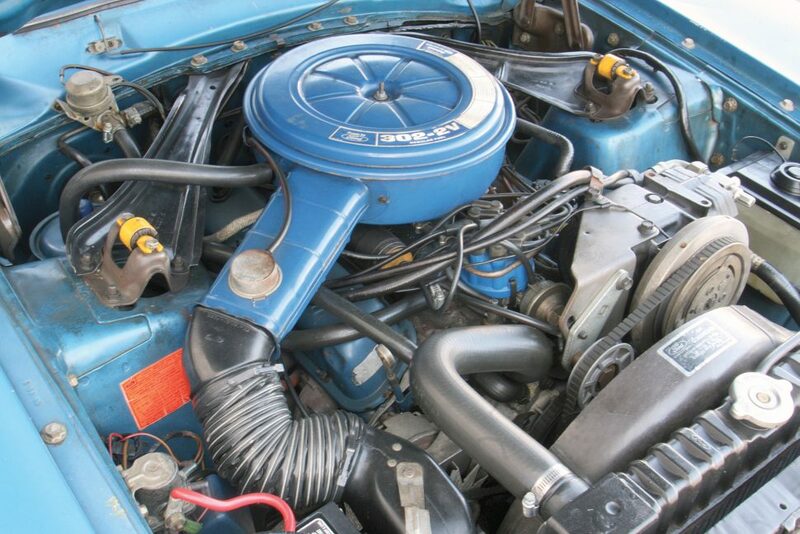 The 302 V-8 became an available option in 1971. Those seeking a bit more go could initially opt for a 200-cu.in. six, rated at 120 hp and mated to either a three-speed column shift manual transmission or the SelectShift automatic. Ford later offered the 250-cu.in six from the Mustang, but this 155-hp option was available only with the C-4 automatic transmission. In 1971, the 302-cu.in. V-8 became available in the Maverick but was fed by a two-barrel carburetor and exhaled through a single exhaust, for a claimed 210 horsepower. Buyers opting for the 302 could choose between the three-speed manual and three-speed automatic transmissions. 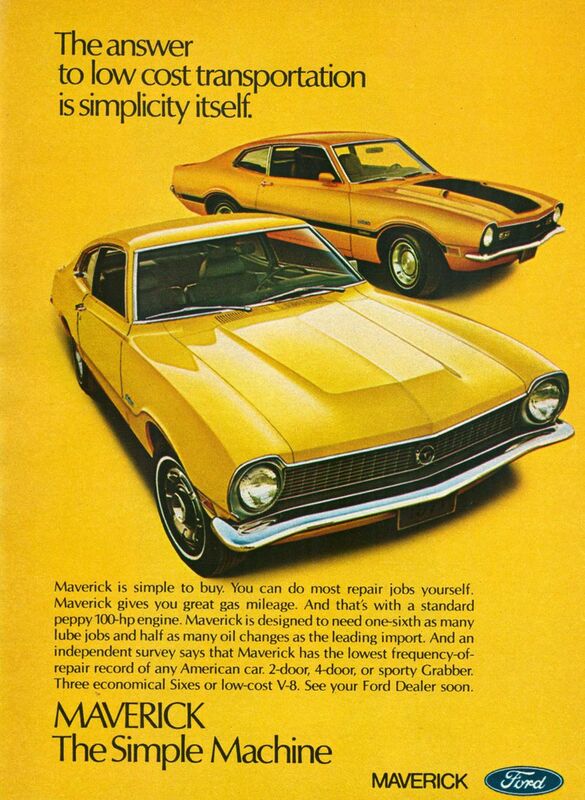 1971 Ford Maverick magazine ad. Remaining images courtesy Lov2XLR8.no. 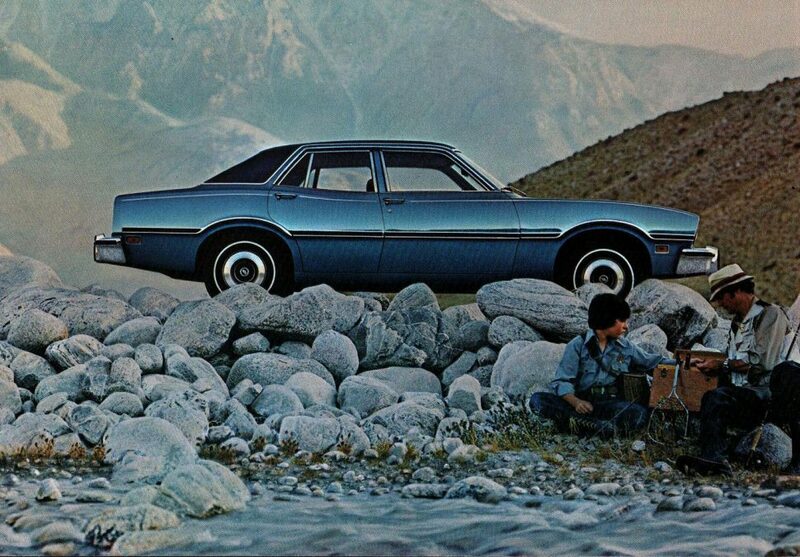 Initially, the Maverick was slated to go out of production in 1975, replaced by the more luxurious Granada, but concerns about another fuel crisis kept the Maverick in production through 1977 (and through 1979 in Brazil). 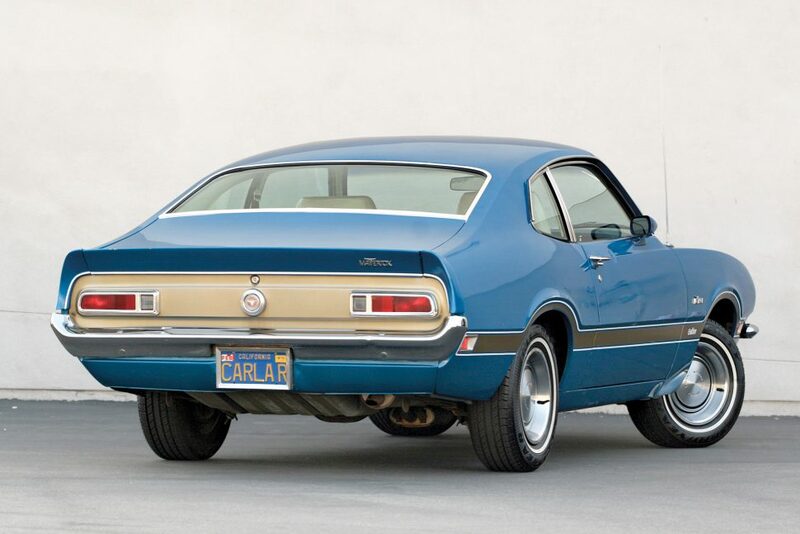 Over nine years of production, buyers in North America snapped up nearly 2.1-million Mavericks, and the car’s best sales year was 1974, when 301,048 left Ford showrooms with new owners. These numbers don’t even include the Mercury-equivalent Comet, which hit dealerships in 1971 and remained on sale through 1977. The Maverick’s 50th birthday will be celebrated at the 2019 Carlisle Ford Nationals, taking place from May 31-June 2, 2019, in Carlisle, Pennsylvania. For additional details, visit CarlisleEvents.com.